In this post, I would like to share two XSSes in toolbar.google.com. I discovered in June 2015 and it has already been fixed. Those bugs are a little unusual. It works only IE which Google Toolbar is installed. IE's Google Toolbar has some special commands. We can execute from web UI of toolbar.google.com. You can reset toolbar settings when you clicked the button in this page. How does it execute command? Let's take a look at command() function. Usually, we will jump to "http://toolbar.google.com/command?..." by this code. But on IE which Google Toolbar is installed, the navigation to "http://toolbar.google.com/command" is treated as special command. To execute command, we will need to put command name to query string. As you can see above page, fixmenu=1 is associated with the reset settings. document.googleToken is used for CSRF token. document.googleToken is random value which is set by Google Toolbar. If the token is not correct, the command execution will fail. toolbar.google.com is the only domain which can access the token. First, to find commands, I explored content on toolbar.google.com and toolbar's binary. Then, I noticed navigateto command. As its name suggests, navigateto command is used for navigation. When I put the following script into IE's developer console on toolbar.google.com, it was actually worked. It took me to example.com. Then I got an alert dialog! But It's too early to rejoice because we can't know document.googleToken from external page. In other words, if an attacker can get document.googleToken, it becomes XSS hole directly. The page has the button which can execute command. If button is clicked, it calls command("&uninstall-dc=anyway&DcClientMenu=false&EnableDC=false&navigateto=" + path + "dcuninstalled.html"); function via OnYes() function. But this code is not good. If the URL has / in the query or hash, it will cut unexpected URL string. So, what will happen if we put the following string? 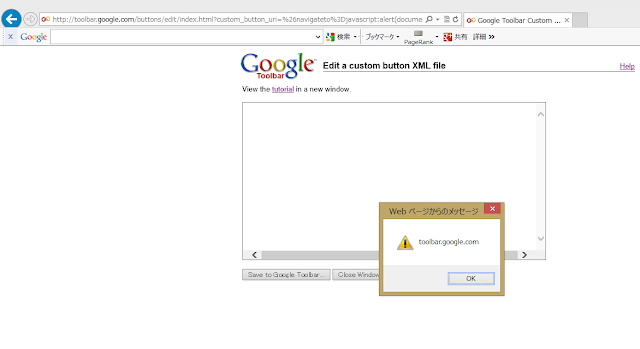 In this way, I have achieved XSS without knowing document.googleToken. The query is decomposed and parameter name and value are took out. Then, as you can see the bold string below, the code tries to find custom_button_uri parameter. If it can find the parameter, it assigns the parameter value to the document.custom_button_uid variable. This means that user input is passed into command via the custom_button_uri query parameter. I reported the bugs via Google VRP and I received the reward of $3133.7 × 2. It is not easy to find and understand non-documented commands, but it was a fun time. And finally, I would like to introduce the holiday gift that I received from Google last year. 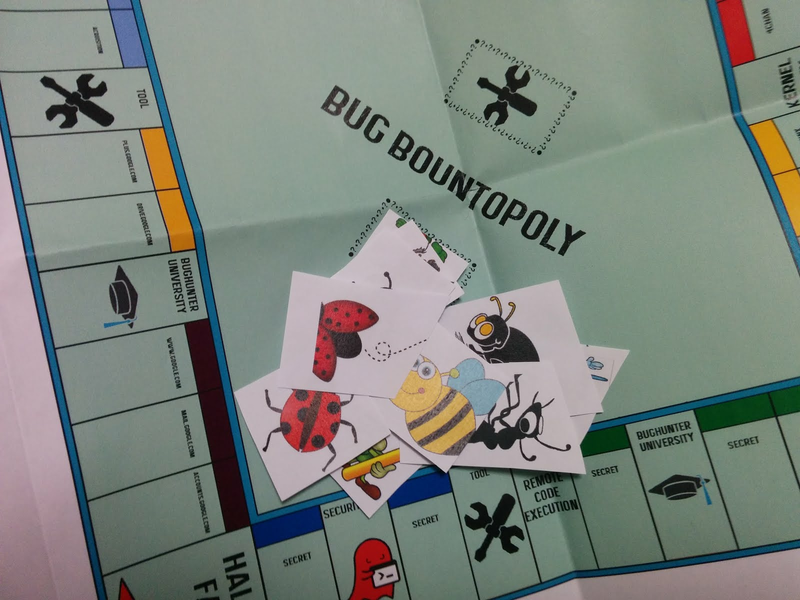 It is the USB Armory, Bug Bountopoly and post card! 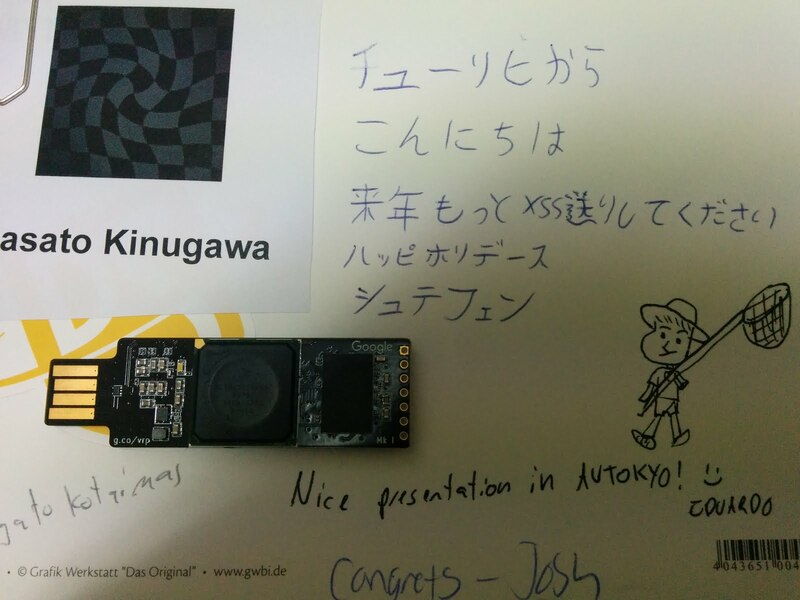 Stephen of Google Security Team gave me the Japanese message and bug hunter's llustration. It's so lovely! I will continue the bug reports again this year. Thank you so much!